Thanks Yvette! We still have much of the world to cover – we have seen only but a speck. Thanks for stopping by 🙂 Hope you are well and had a lovely Thanksgiving! Hope the festive season ahead is wonderful for you. Must have been so moving. Such an appropriate photo for this theme. It was very moving! But was emotionally really hard was the museum. We last about 10 minutes before we made a beeline for the exit – so upsetting! Some very wise words here! Thank you! Sadly, all wars have so many horrific tales to go with them yet as a society, although we don’t forget about them, somehow the lessons never get learned and it all happens again in another shape or form. Thank you for your comment and for also following our blog! We really appreciate it. A great choice for the challenge this week and a lovely photo too. Well done monkeys! 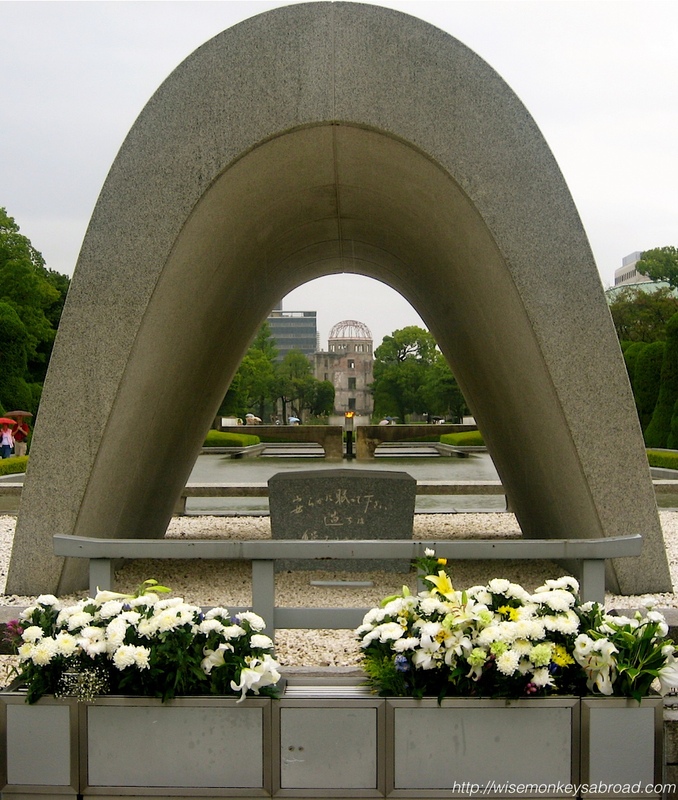 Hiroshima was a nice place but forever under the reputation of that horrific day in 1945. I enjoyed the Peace Park and the A-Bomb Dome. Very touching. Your words are very true. Thanks for stopping by! Great choice for this challenge, Hiroshima is such an emotional place! Thanks! It was very hard for us to stay in the museum so we left after about 10 minutes. But Hiroshima is definitely a city to experience. The Memorial Park was very moving and was peaceful! It was the actual museum that was impossible to visit for us – we walked in and after about 10 minutes, it became too hard and emotional so we left! This and Auschwitz were the two emotional hardest things we ever have done. Thank you 🙂 It was a very moving place!